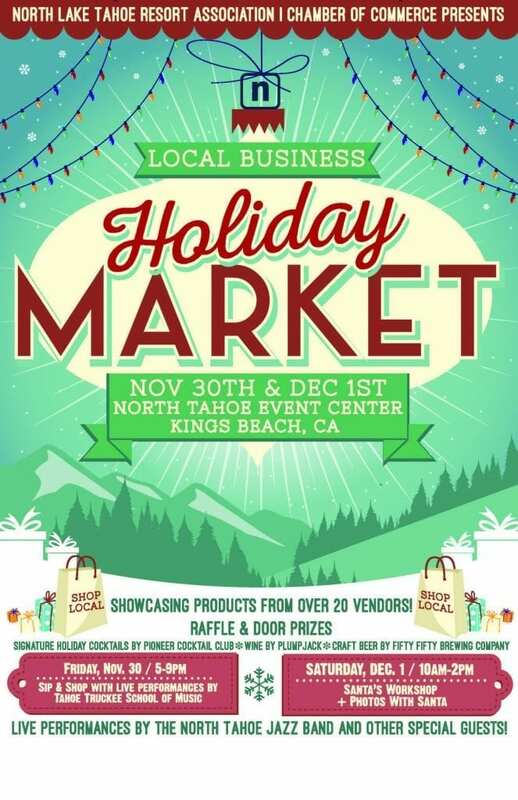 The North Lake Tahoe Resort Association/Chamber of Commerce will host a Local Business Holiday Market to highlight the incredible range of artisans and businesses on Friday, Nov. 30 and Saturday, Dec. 1 at North Tahoe Event Center. This one-stop shopping event amplifies the Shop Local experience just in time for holiday gift-giving, showcasing products from over 20 vendors. Shoppers who present a receipt from one of the vendor booths will be entered to win a specially curated Tahoe-made gift basket and there are a number of raffle prizes available. The Friday Market will take place from 5-9pm and shoppers will enjoy a festive atmosphere and live music. The Saturday Market will open from 10am-2pm, children are encouraged to attend for hands-on crafting at a specially curated Santa’s Workshop, photos with Santa and live performances by the North Tahoe Jazz Band. Both events will have food and signature holiday cocktails, along with beer and wine available for purchase.